There is a place where driving pleasure reaches its pinnacle. Where the laws of physics are set in asphalt, and where gravity insists on finding its center.It’s a point so precisely located, a single degree can be the difference between a perfect moment and profound disappointment. 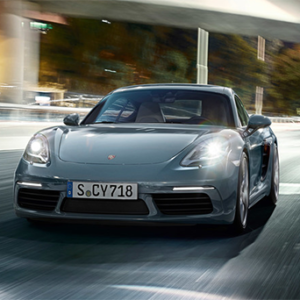 Welcome to the apex of the curve, where the new Porsche Cayman lives. 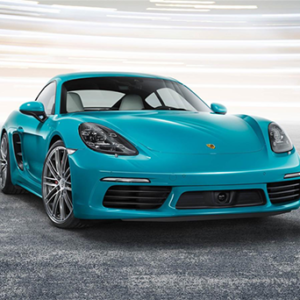 Cayman is a sports car concept that pursues performance unconventionally.With its mid-engine design, the Cayman centers weight low in the chassis, so the car’s center of gravity is directly beneath the driver seat. The connection between car and driver is pure and undiluted. 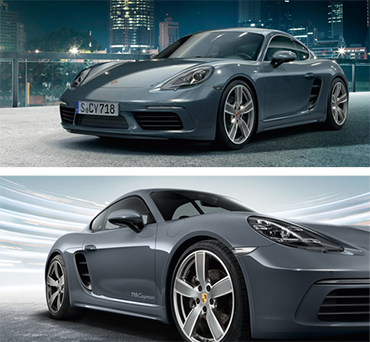 And now, the Cayman concept enters its second generation. 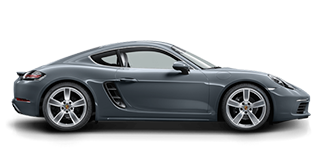 New chassis developments, new engine developments, and a front-to-tail redesign of its coupe shape create an entirely new Cayman, with enhanced levels of power, efficiency, and handling agility. 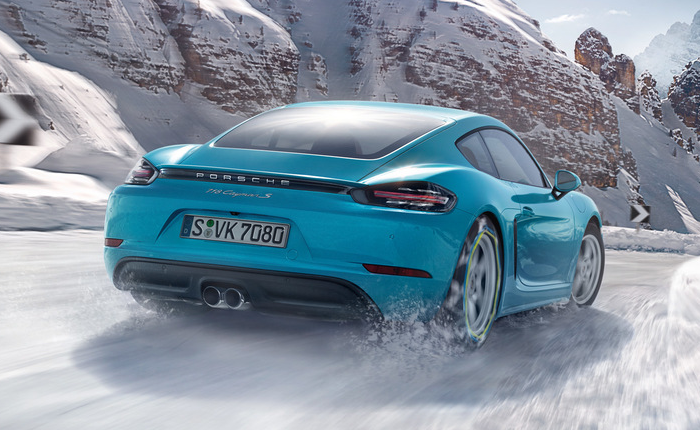 Enter a corner and roll on the throttle: Whether you choose the Porsche Cayman model with its new 2.7-liter, 275-hp six cylinder engine or the Cayman S with its 3.4-liter, 325-hp six, pressing the accelerator creates forward propulsion combined with formidable lateral grip. 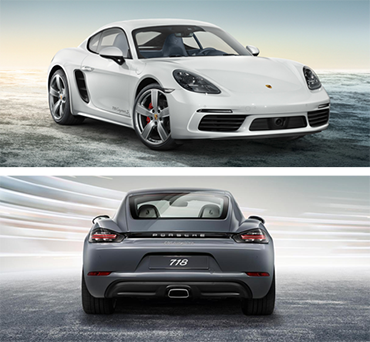 The new Cayman and Cayman S. There’s an apex just waiting for you to arrive. 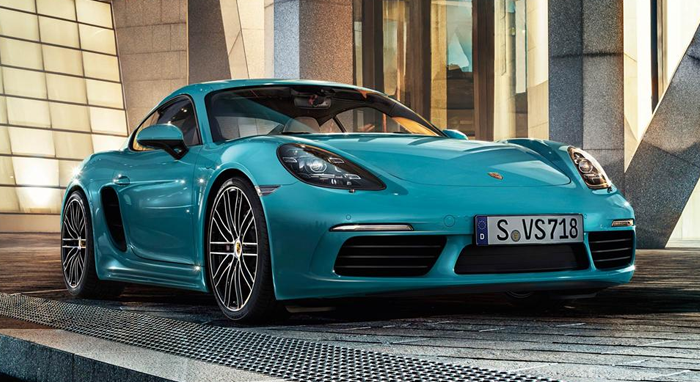 The new Porsche Cayman is the sequel that continues the 718 era. At their heart, a four-cylinder turbocharged boxer engine beats with the same fighting spirit that delivered countless podium finishes. In them lives the will to break away from standards. And to inspire conviction. So it is entirely appropriate that they, too, should bear these three digits in their name and carry the 718 legend forward. 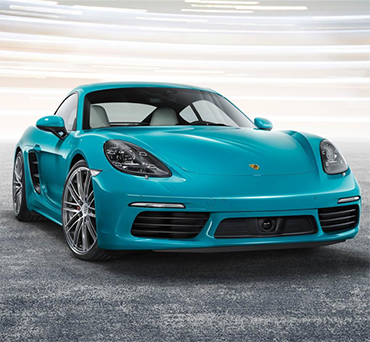 The new 718 Porsche Cayman lets its actions do the talking. Sporty actions, of course. As a corner-devouring coupé, it follows a line of its own far removed from fashion trends and four-lane arterials. In the town certainly. On the racetrack definitely. But always for the sport of it. Acceleration is key for us. It's also key in the digital age. The world is turning faster and faster. It’s good if you can keep up. And even better, if you can stay one step ahead. Our solution: e-mobility. An overall concept that combines a pioneering drive system, practical charging options, intelligent mobile online services, and efficient performance. E-Mobility Services are part of Porsche Car Connect (PCC). 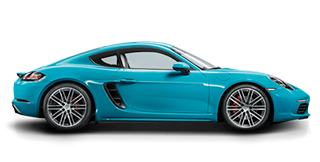 They enable you to call up all the important information about your 718 Cayman S remotely via a smartphone app. Using Remote Services,you can find out statistical data on your vehicle, such as the distance driven, average speed, or fuel consumption on the last trip. In addition, you can view information on the remaining charging time, battery charge status, or a visual depiction of the electric range. You can also set the charge timer with customizable charging times, while Carfinder shows you the shortest route back to your Porsche from your current location. 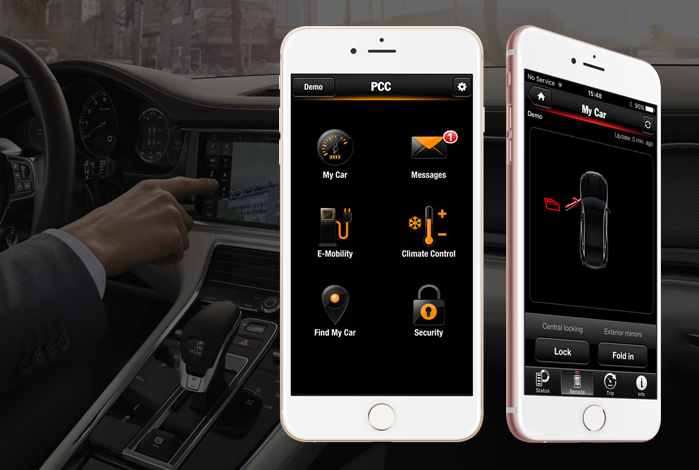 Another particularly practical function: Porsche Car Connect (PCC) allows you to check the status of your alarm system or make a breakdown call at any time from virtually any location. Using a compatible smartphone, you can control the charging process, along with other functions, such as the optional auxiliary climate control, which allows you to heat or cool the interior in advance of any journey. Of course, the future will come whatever happens. However, we intend to meet it along the way. 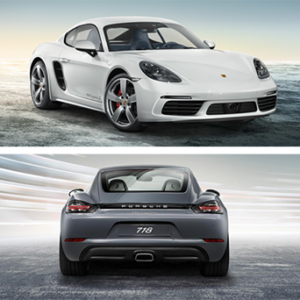 Study the sculpted lines and edges, narrow wheel arches, short overhangs, taut proportions, and sleek silhouette of the new Cayman. 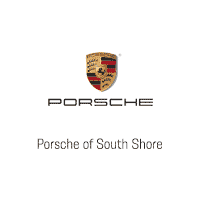 What you will observe is a design aesthetic that is unique to Porsche. The family values encoded into the Cayman genes since the very beginning are evident. No matter where your eye falls, it sees the Porsche character, the Porsche profile, and the unwavering Porsche belief in form following function. The new front is dominated by the prominent fenders. 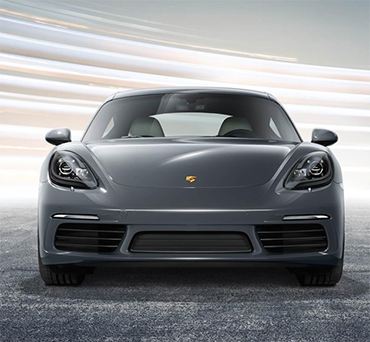 With its large and dynamic air intakes, the front end signals the powerful persona of the Cayman. 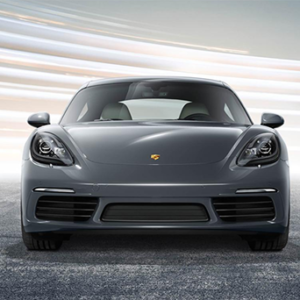 Restyled headlights—-inspired by the Porsche racing heritage of the 1960's and 1970's—are the windows to the soul of the Cayman. 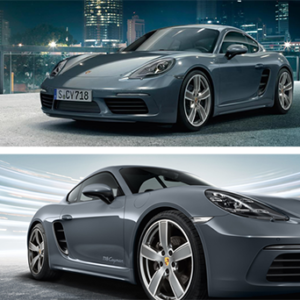 The circular front light units integrated in the air intakes are a signature of Cayman styling and incorporate LED daytime running lights and position lights. Precise edges stretch backward along the roof to the rear. In conjunction with the wide track, the effect is a sculpted and honed physique. Imposing fenders lend prominence to the wheels.The wide brake light is an integral feature of the large rear window.The rear spoiler is more than a stunning eye-catcher. It deploys automatically at 75 mph to effectively enlarge the aerodynamic surface area and increase down force. 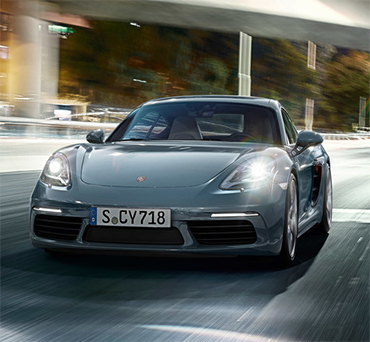 The firm contact with the road heightens driving pleasure at the limits of performance. Creating an uncompromising sports car takes conviction. Giving it an unmistakable design takes creativity. Combine both conviction and creativity and apply it to the interior design. What results? An environment where the driver is central in the driving experience. 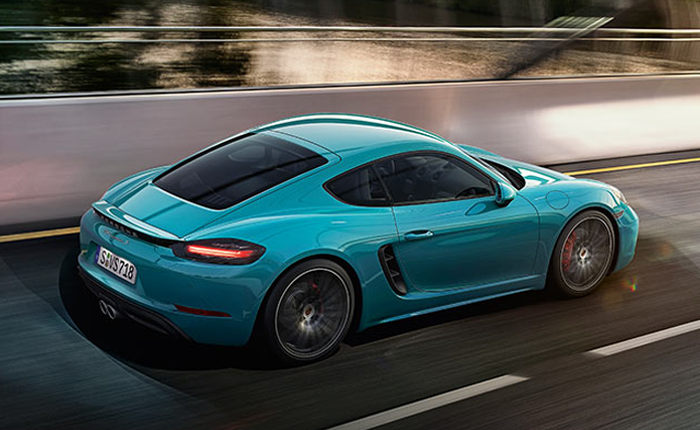 In the new Porsche Cayman, this has been made possible by a new interior architecture that gives a feeling of open space and offers plenty of freedom of movement around the low-positioned standard sport seats. The central feature of the interior is the redesigned ascending center console.We believe that the gear lever should be positioned close to the steering wheel to enable fast, efficient, and ergonomic gearshifts. It’s just one of many principles that we’ve transferred from the racetrack to the road. As you would expect, the ignition lock is on the left. The three-spoke sport steering wheel fits the hand perfectly. Behind it are the three central circular instruments, which give you all the important information you need.The new and generously proportioned luggage compartment is located underneath the wide rear window. The large rear hatch above the exquisitely styled luggage compartment has a wide opening angle. The luggage protection bar is finished in Brushed Aluminum just like the inlay between the upper and rear luggage spaces.Storage compartments on both sides offer additional storage room. To further enhance the interior, we offer a comprehensive range of personalization options and a wide selection of colors and materials. All to create your unique vision.